It's difficult to choose a Roast Chicken Recipe because roast whole chicken is my favourite chicken dish to cook and it appeals to almost everyone as a great meal. "Best Tips For Memorable Oven Roast Chicken." Oven Roasted Chicken is probably one of the most fuss-free and easy ways to cook a dinner and it allows for cooking creativity should you feel like experimenting with different ingredients and herbs for flavouring. I am often asked for an easy Roast Whole Chicken Recipe by friends. 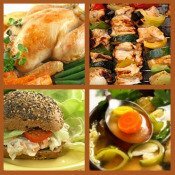 Every chef will have their favourite Roast Chicken Recipe and these time honoured cooking methods make meals memorable. Below are some of the best "how to roast chicken" tips I ever tried. They have resulted in producing even better oven roasted chicken recipes. You can incorporate these cooking tips into whatever your prefered roast recipe is. Try to push some of your seasoning under the skin of the chicken without tearing it. This helps to keep the meat moist and adds great flavour. Rub softened butter all over the outside of the chicken and also some under the skin. This gives the skin a gorgeous golden colour and makes it quite crispy. This is the best tip: The cavity of the chicken can be filled with whatever flavour enhancing ingredients you prefer. Lemon, onion, fresh herbs and garlic all work very well. Don't forget to season the inside too with salt and ground black pepper. My favourite recipe for roasting chicken is to put 1 chopped whole onion, a few large chunks of chopped carrot and about 3 peeled cloves of garlic in the chicken cavity. I was amazed at the difference in the taste of the chicken meat. To really get the roast chicken skin crispy, try to roast it on a rack with a pan underneath to catch the fat and juices. The free flow of heat will crisp up the underside and the juices will caramelise in the pan underneath and the fat can be poured off. The caramelised juices can then be used to make a flavourful sauce or gravy. Roast Chicken Cooking Time: Getting the cooking times and temperatures right is something you can experiment with as ovens vary and so do chicken weights. Some cooks like to give the whole chicken an initial blast of heat at about 450°F or 230°C for about 20 minutes to brown the skin and then turn the heat down to 375°F or 180°C for the remaining cooking time which is worked out at 10 minutes per 500g of chicken. A good indicator for when a roast chicken is done is when the juices run clear from the cavity if the chicken is tilted. The juices should also run clear when the meat is pierced in the thigh. Once the oven roasted chicken is cooked don't rush it to the table for carving. Let it stand for about 10 minutes, this improves the flavour and texture of the meat. Making Roast Chicken Gravy : Gravy is made form the delicious juices and bits and pieces that are left behind in the roasting pan after roasting the chicken. Once the roast whole chicken is cooked, remove it from the roasting pan and set aside to rest so the meat relaxes. Add about 15 - 20 ml of flour to the juices and fats and stir over a low heat for a few minutes and the mixture starts to bubble. Make sure all the lumps of flour have been stirred out. If you feel that it needs more flavour you can add a teaspoon of chicken stock powder. Turn up the heat and the add 250 ml of wine or water to the pan. Stir until the gravy boil and thickens into a smooth consistency. You can strain the gravy if you want to remove any lumps. As an alternative to roasting your chicken you might want to try a Clay Baker. I recently discovered a Clay Baker and found it to be so useful because the chicken doesn't dry out unless you realy leave it in for a long time. They are also very easy to clean because food doesn't stick to it. It's also fantastic for the low-fat recipe seekers because the food cooks in its own juices. The perfect side dish to roast chicken is roast potatoes. You can find out the secrets to pefect roast potatoes at Best-Potato-Recipes.com - a searchable collection of the best potato recipes from around the world.